Tetris: The Games People Play is writer-artist Box Brown’s follow up to 2014’s seminal read, Andre The Giant: Life and Legend. 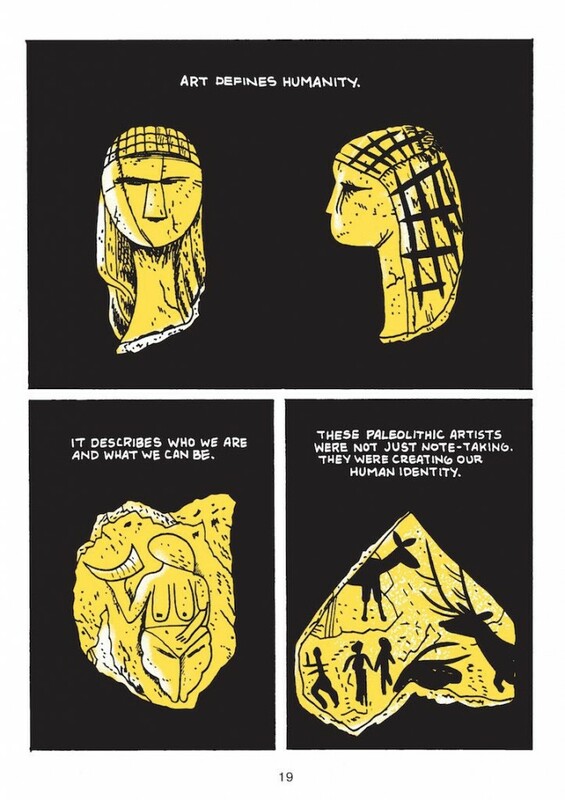 Along with his talents as an artist, Brown’s aptitude for unusual subject matter makes him standout in a comics landscape that isn’t exactly hurting for biographical/autobiographical works. Life and Legend was compelling in how it chose to portray Andre Roussimoff’s life in fragments, often going off anecdotal first-hand accounts from people who knew him in order to paint a larger picture of a complicated man who was literally larger than life. With Tetris, Brown goes after a significantly more ambitious target: How do you turn the story behind a geometrical puzzle game into a page-turning graphic novel? Brown, to his credit, approaches the history of Tetris as a small but crucial stepping stone in not just the history of video games but the shared human concept of games. Brown’s narrative choices are bold and ambitious. The book opens on Tetris creator Alexey Pajitnov and best friend Vladimir Pokhilko in Moscow in 1984 before doubling-back 17,000 years into the past to take us through the development of dice and gaming up into modern day. The book wisely uses the development of Nintendo from a card game company into a video game powerhouse as a narrative bridge. Brown argues that Tetris was just the latest in a long history of cultural pastimes in an attempt to understand why games, and especially video games, are such a crucial part of the human experience. If anything, you wish the book was just one part of a larger series ala Ed Piskor’s multi-volume Hip Hop Family Tree: There’s so much history to unpack with the history of games that one graphic novel doesn’t feel like enough. Brown’s visuals are subdued but deceptively complex. The book is entirely in black and white with bright yellows for backgrounds and object emphasis. The end result is that the the world as portrayed on the page feels like it’s being viewed through an original Gameboy or Texas Instruments calculator, the exact kind of devices used to play the game initially. Brown’s line work tends toward harsh geometric shapes, which serves to make the mundane locales of Tetris (like Moscow at the height of the Cold War or drab software company buildings) all the more oppressive. While Brown has a patented style that favors simplicity, that simplicity makes the book’s more experimental sequences pop. In particular, Brown’s pen and ink portrayal are used to great effect for the digitized Russian photography placed in the background of Mirrorsoft’s consumer-grade version of Tetris or the 8-bit look of an Asteroids knockoff. If anything suffers here, it’s that Brown’s cast of software engineers and corporate muckity mucks are doomed to look nearly interchangeable in some scenes. The problem of Tetris: The Games People Play is that its reach exceeds its grasp. Brown uses the game of Tetris to pose questions about humanity but doesn’t dig into his characters’ interpersonal relationships in a satisfying way. The book’s central struggle, a bidding war with the USSR between various software companies for the rights to Tetris, is the kind of gripping drama great New York Times pieces are made from. It’s suspenseful, funny and generally compelling. 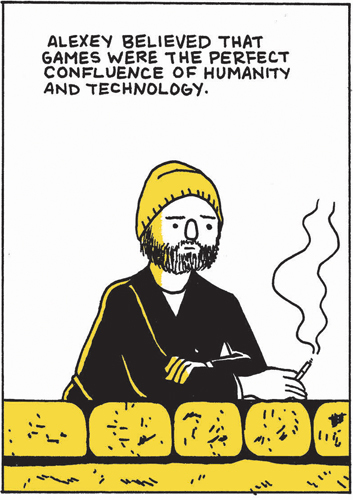 But while Brown’s portrayal of Pajitnov as a benevolent genius trying to make art in a country that punishes creativity gives Tetris some genuine humanity, he never feels like anything more than a basic character sketch. Publishing mogul Robert Maxwell’s mysterious death aboard his private yacht and Pokhilko’s later murder-suicide are given a page of fairly dry notation before moving onto the next historical event. This feels like a real disservice, especially given that Pajitnov and Pokhilko’s friendship is arguably the core of the book and some kind of insight into how this affected Pajitnov would have gone a long way toward giving the graphic novel a sense of closure. 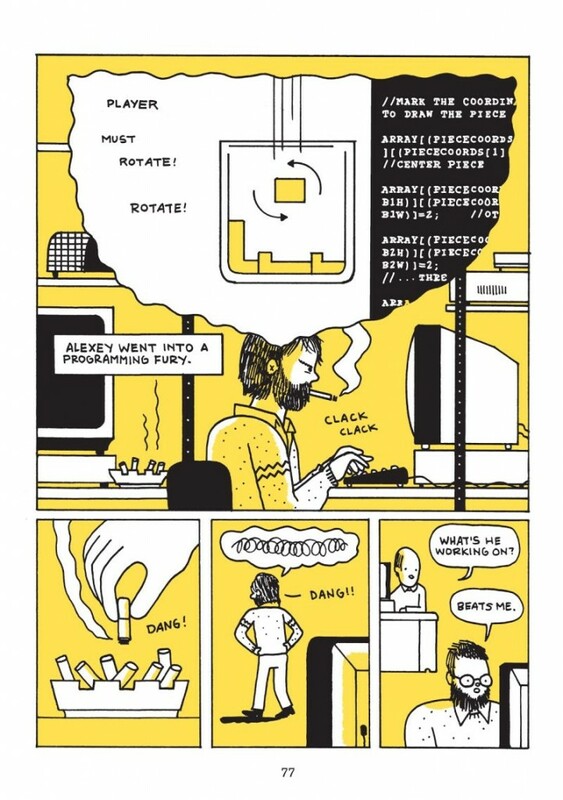 For a book that tries to place the puzzle pieces behind why human beings do what they do, Tetris unfortunately feels at times a little antiseptic: It’s hard to feel emotionally invested in a comic that doesn’t feel especially emotionally invested in itself. 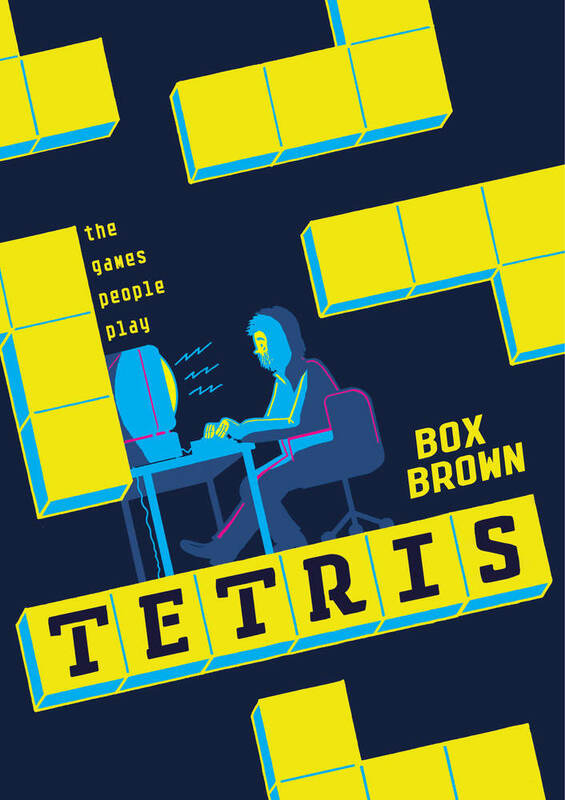 Despite its storytelling flaws, Box Brown’s Tetris is an admirable and engaging look at video game history from a unique perspective. Tetris: The Games People Play is in stores now. Next → Next post: Deadshirt is Watching: Westworld, Timeless, and You’re the Worst!